A couple of years ago a scientist looking at dozens of MRI scans of human brains noticed something surprising. A large, fiber pathway that seemed to be part of the network of connections that process visual information showed up on the scans, but the researcher couldn't find it mentioned in any of the modern-day anatomy textbooks he had. "It was this massive bundle of fibers, visible in every brain I examined," said Jason Yeatman, a research scientist at the University of Washington's Institute for Learning & Brain Sciences. "It seemed unlikely that I was the first to have noticed this structure; however, as far as I could tell, it was absent from the literature and from all major neuroanatomy textbooks." With colleagues at Stanford University, where he was a graduate student at the time, Yeatman started some detective work to figure out the identity of that large, mysterious fiber bundle. 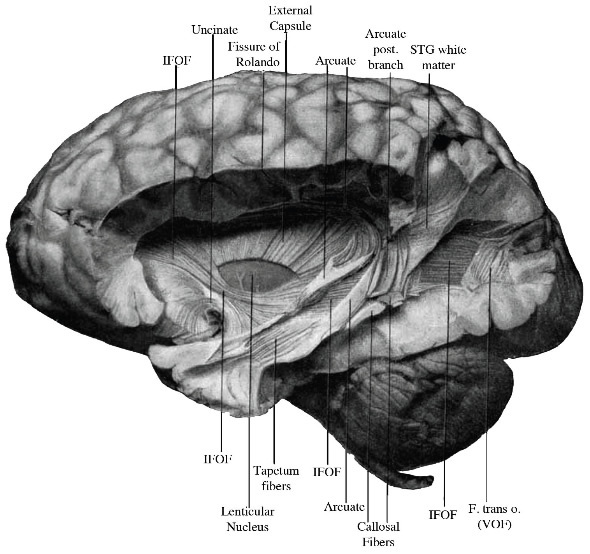 In the paper, published November 17 by the Proceedings of the National Academy of Sciences, the team describes the history and controversy of the elusive brain pathway, explains how modern MRI techniques rediscovered it, and gives analytical tools researchers can use to identify the brain structure -- now known as the vertical occipital fasciculus. The "aha moment" in identifying the pathway came while Yeatman and Kevin Weiner, a Stanford postdoctoral researcher, were poring over the yellowed pages of 19th-century brain atlases in the basement of the Stanford Medical Library. "Kevin found an atlas, written by Carl Wernicke near the turn of the (20th) century, that depicted the vertical occipital fasciculus," Yeatman said. "The last time that atlas had been checked out was 1912, meaning we were the first to view these images in the last century." In an 1881 neuroanatomy atlas, Wernicke, a well-known anatomist who in 1874 discovered "Wernicke's area," which is essential for language, wrote about a fiber pathway in a monkey brain he was examining. He called it "senkrechte Occiptalbündel" (translated as vertical occipital bundle). But its vertical orientation contradicted the belief of one of the most renowned neuroanatomists of the era, Theodor Meynert, who asserted that brain connections could only travel in between the front and the back of the brain, not up and down. 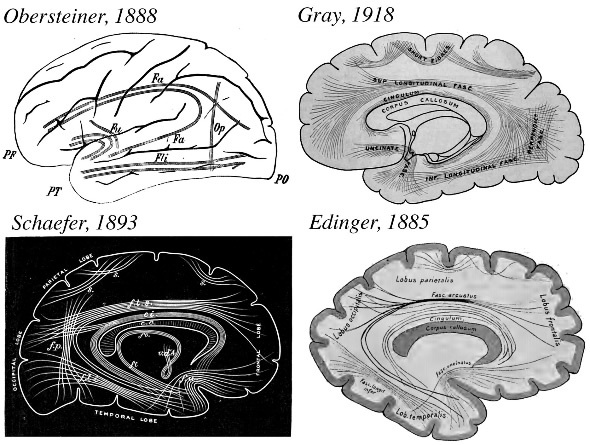 The 1880s and 1890s were a fertile time in the neuroanatomy world, but scientists lacked a shared process for naming the brain structures they found. 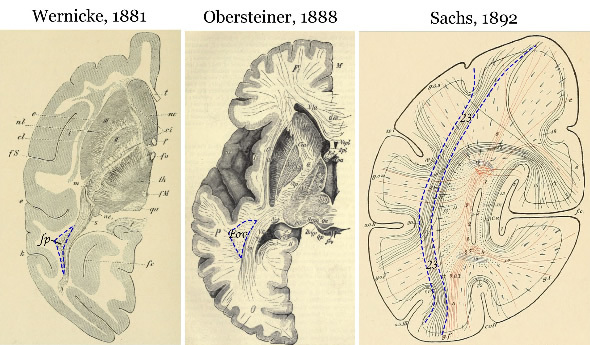 Looking at drawings of the brain from this time period, Yeatman and coauthors saw that the fiber pathway that they were looking for appeared in brain atlases but was called different things, including "Wernicke's perpendicular fasciculus," "perpendicular occipital fasciculus of Wernicke," and "stratum profundum convexitatis." "When we started, it was just for our own knowledge and curiosity," said Weiner, who's also the director of public information at the Institute for Applied Neuroscience, a nonprofit based in Palo Alto, California. "But, after a while, we realized that there was an important story to tell that contained a series of missing links that have been buried for so long within this puzzle of historical conversation among many who are considered the founders of the entire neuroscience field." The researchers used a type of MRI measure called diffusion-weighted imaging to measure the size of the pathway and see where in the brain it went. Across brain scans taken from 37 subjects, they found that the vertical occipital fasciculus begins in the occipital lobe -- the part of the brain's visual processing system located at the back of the head. From there, the fibers spread out like a sheet, connecting brain regions that are important for seeing objects with other brain regions that coordinate which objects to focus attention upon. "We believe that signals carried by the VOF play a role in many perceptual processes, from recognizing a friend's face to rapidly reading a page of text," said Yeatman, who is now studying brain mechanisms involved in learning to read. In the paper, the researchers also provide an algorithm that others can use on their own data to find the pathway and measure its properties. "To support reproducible research, our lab makes a strong effort to share software and data," said Brian Wandell, senior author of the paper and a psychology professor at Stanford. "We believe this is a powerful way to ensure that our findings can be both checked and used in labs around the world." The researchers also hope that the algorithm will enable other researchers to study the pathway, possibly leading to a better understanding of its role in human cognition and in patient populations.